The Gmail and Email apps aren’t simply ways to receive electronic mail on your Nexus 7 — they can also be used to compose new mail. Crafting an e-mail epistle on your tablet works exactly like creating one on your computer. Start an e-mail app — either Gmail or Email. Touch the Compose icon button. Touch the To field and type the e-mail address. You can type the first few letters of a contact’s name and then choose a matching contact from the list that’s displayed. Touch the Send button to whisk your missive to the Internet for immediate delivery. Copies of the messages you send in the Email program are stored in the Sent mailbox. If you’re using Gmail, copies are saved in your Gmail account, which you can access from your Nexus 7 or from any computer or mobile device connected to the Internet. The Email app features two additional icon buttons, just to the right of the Send button: Save Draft and Discard. To get to the Save Draft and Discard commands in Gmail, you need to touch the Menu button in the upper-right corner of the screen. Choose the Save Draft command to store the message in the Drafts folder. You can open that folder to edit the message. Touch Send to send it. To cancel a message, choose the Discard command from the menu or touch the Trash button, as shown in the margin. Touch the OK button to confirm. To summon the Cc field in Gmail, press the +Cc/Bcc button. The Cc (Carbon Copy) and Bcc (Blind Carbon Copy) fields appear, eager for you to fill them in. 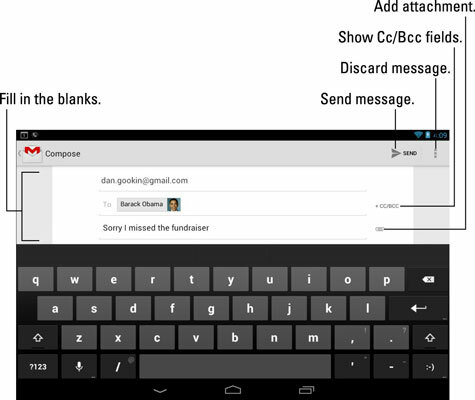 Choose Gmail to send the message using Gmail, or touch Email to compose an e-mail message using your main e-mail account. Other options may appear on the Complete Action Using menu. For example, a custom e-mail app you’ve downloaded may show up there as well.